Spain will host a 500-million U.S. dollar development and testing center of hyperloop, a new transport system based on a train car that levitates through tubes by magnetic fields. It can reach up to 1,200 kilometers per hour, according to an agreement signed by the government and the American company Virgin Hyperloop One. "It will make Spain a world benchmark for the new hyperloop transport system by setting up a testing and development center for the advanced technology. 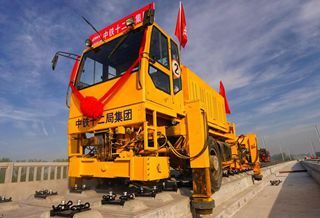 The subsequent implementation of an innovation ecosystem will attract multinational and Spanish companies," the Administrator of Railway Infrastructures (ADIF) said in a press release Tuesday. After months of analysis of the viability of the project, Virgin Hyperloop One chose Spain as the international center for the development and manufacture of commercial prototypes due to Spain's unique experience in infrastructure engineering and technology, the availability of highly qualified talent and the country's leadership in high-speed transport. Thanks to this agreement, Spain will develop, test and validate the components of this new system, subsequently achieving its certification according to European regulations. The facilities will be installed in a government experimental building in Bobadilla, Malaga. More than 250 people will be employed and the center will have a value of approximately 500 million dollars. "The region will have the high-tech capabilities inherent in the Hyperloop One system, such as material innovation, production of magnetic levitation systems, tunnel safety devices, advanced techniques in electronics and telecommunications, complex transport operations processes in demand, and new telematics applications between infrastructure and vehicles," said ADIF. According to the entity in charge of the railway field in Spain, the Virgin Hyperloop One transportation system, based on the original idea of Elon Musk for Tesla, will change the way of traveling. It will improve cargo flows and logistics on demand, with great socioeconomic benefits, offering a network system that connects remote cities and reducing travel times from one hour to minutes. "People and goods will move by vehicles that are gradually accelerated by electric propulsion in low-pressure tubes. The vehicles float on the track with magnetic levitation and glide at speeds similar to the plane due to the ultra-low aerodynamic drag. It is completely autonomous and eliminates impacts caused to human errors," said ADIF.